Mastery@Work helps employees to focus their attention at work so that work gets done at work. It teaches employees to build their attention span so that they can work without disruptions and so that they become deeply immersed in their work. It builds the habits of active reflection, teaching employees how to become more aware of how they work and where their attention is focused. In a nutshell, Mastery@Work teaches employees to be more productive at work, building habits of focus that allows them to become better in their fields. In an age of constant connection and instant fulfillment, there are many distractions competing for an employee’s attention. This creates a fragmented focus or continued partial attention, which causes mental fatigue, chronic stress and lowered productivity levels. Why is this an issuse? Employee loyalty, and hence staff retention, arises from engagement, learning opportunities and skills development. Add to this the fact that today’s knowledge workers control the pace of production, fatigued knowledge workers results in a drop in productivity. It is also recognised that the traditional productivity measures and tools such as time sheets and the new workspaces that are inspired by the Google culture do not work in the long term. Since knowledge worker salaries are increasing year on year, this then poses the challenge of how we get employees to be more productive and engaged in their work, without increasing the overhead costs? Executives are unanimous in their call for a tool that allows individuals to be productive in an open plan, and increasingly, office environment. Over the past decade of working with skilled knowledge workers in a demanding industry, we at Chillisoft have observed the behavioural patterns of organisations and employees as it relates to focused attention and the ability to concentrate. We have studied and incorporated organising practices and individual habits, along with what we’ve learnt from our research into Flow, positive psychology, physiology and learning patterns, into a product call Mastery@Work. We recognise that in order to effectively harvest creativity, discipline and habits around work structures must be embedded in both the organisation and the employee’s autonomic systems. Our solution, Mastery@Work is thus designed specifically to create the required paradigm shift within the organisation and within the employee’s mindset. Mastery@Work focuses on building mastery, wellness and EQ amongst employees, via disciplined habit forming practices. Mastery@Work is a product that aims to teach individuals in corporate companies how to focus their attention in order to massively increase their productivity at work. how to deliberately focus their attention. the impact on their brain when continually suppressing distractions. their actual commitment to learning and developing skills when typical excuses are removed. how to reflect on their individual practice so that they learn and get better. We do all of this in a subtle, unobtrusive way that builds engagement, whilst providing knowledge on health, focus and impact of mood. 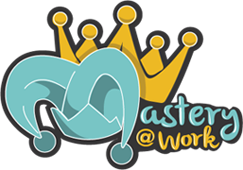 Mastery@work is developed as a serious game that is played by employees at work, every day. It is integrated with a separate product called MindMatter which teaches employees how to mentally prepare to focus. The software runs on desktops and synchronises the employees’ data to the cloud. The data remains confidential and is only viewed by the employee since it is related to their progress at work. For information on how Mastery@Work can improve productivity, employee engagement and retention in your company contact us today for a workplace assessment.